A fox was hit by a car and left for dead on the side of highway. She would have succumbed to her injuries, but the right person found her and saved her life. Her recovery is heartwarming. When kindhearted people unselfishly give of their time and resources to help an animal in distress...Miracles Happen! 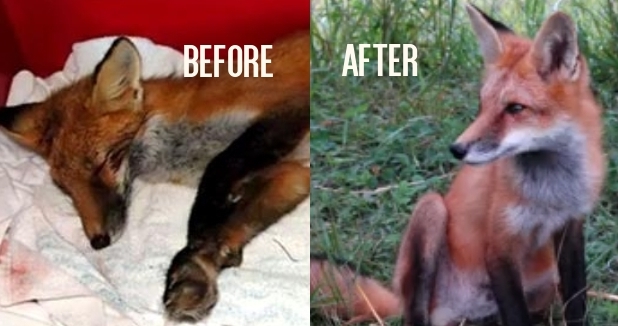 This is a story of a young fox that was left for dead on the side of the road. It's a story of hope and compassion and the amazing will of an animal to survive. Road Accidents: Hundreds of thousands of wild birds and animals are killed and injured on roads every year. The really sad thing is that so many are left to die a slow death as they are repeatedly run over when many could be saved with proper help. The most important thing you can do here (apart from calling a rescuer urgently), is minimise the casualty’s stress. If the casualty is not moving and it is safe to do so you can approach carefully and put a coat or blanket over its head. This will help to stop the casualty becoming too stressed. Responses to "“Roadkill” Fox Left for Dead Receives a Miracle"
Most people don't have a heart or sympathy for wild animals,glad to see there are a few left !! Prayers and blessings for you! !